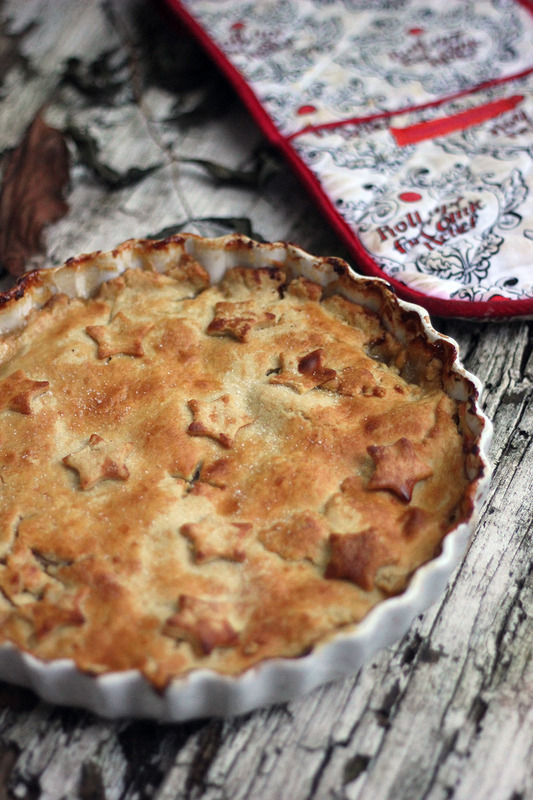 I woke up on Sunday morning after a very busy couple of days with a huge urge to make an apple pie. So I grabbed a copy of my Baking Bible by Mary Berry and got baking. I've slightly adapted the recipe to my own taste, as her recipe includes cloves and I'm not the biggest fan. Pies like these are just what you need on a cold Autumn day, they're filling, delicious and the perfect accompaniment to a special Sunday dinner. My family absolutely loved eating this so I know it's one I'm going to be making again, next time I might add blackberries or raisins to add some extra sweetness into it! 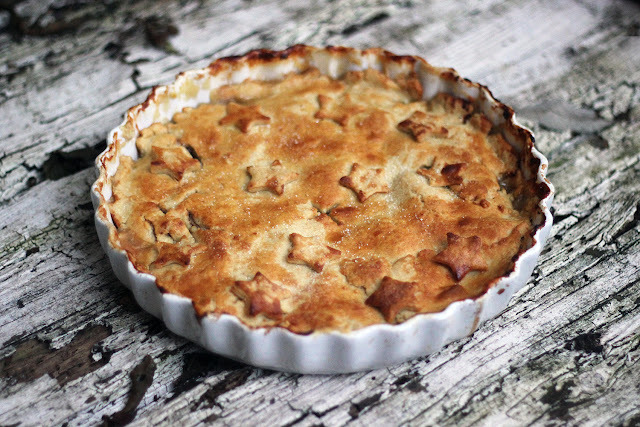 Use a shallow pie dish. Peel, core and cut the apples into thick slices. Arrange half if the slices in the bottom of the dish, sprinkle with half of the sugar and spices. Then add the rest of the apple slices, the sugar and the spices. Then drizzle over the cold water. To make the pastry, measure the flour into a bowl. Add the diced butter and white vegetable fat and rub together with your fingers until the mixture becomes like breadcrumbs. Add the water and mix to a firm dough. Roll out the dough onto a lightly floured work surface to a size that will cover the top of the pie dish. Lift the dough on the dish and trim the edges. If you like, you can use the trimmings make decorative shapes and light press on to the dough. I chose to add on stars but hearts, leaves or flowers could work too. Chill in the fridge for 30 minutes. Pre-heat the oven to 200C. 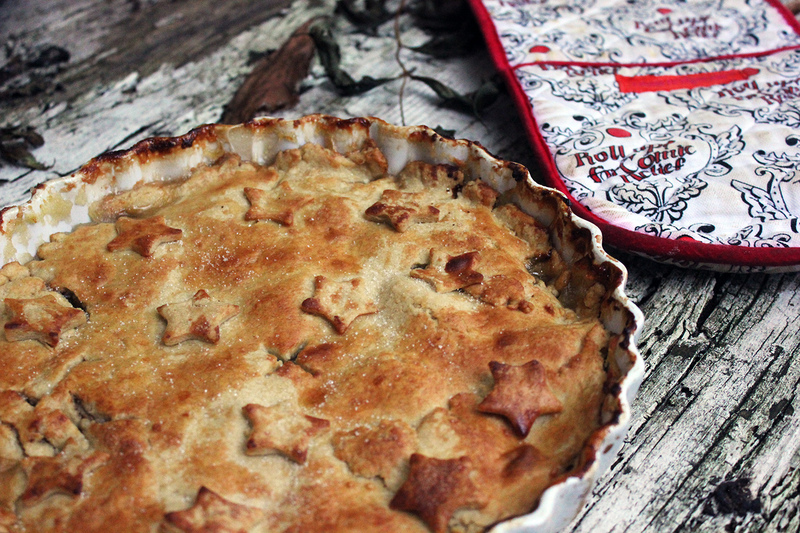 Brush the pie with a little milk, then sprinkle on the sugar. Make a small slit in the centre of the pie for the steam to escape. Bake in the pre-heated oven for about 40 minutes, until the apples are tender and the pastry is crisp and a light golden colour. Cover the pie loosely with foil towards the end of the cooking time if the pastry starts to brown. If your fancy really treating yourself serve with custard or good quality vanilla ice-cream. Enjoy!